6 × = six Required Please enter the correct value. Apple Inc. (Nasdaq: AAPL) has the potential to be the first company ever to reach $1 trillion in market capitalization. And I believe it will in a relatively short order – but it won't be easy. Apple took the most valuable company crown from Exxon Mobil Corp. (NYSE: XOM) in January after stunning December quarter results sent the stock soaring. Yesterday (Wednesday), AAPL's market cap crossed $500 billion. As Apple's valuation has climbed, fueled by a five-year average annual growth rate of 59%, more people have started throwing the t-word around – as in trillion. "Apple's a no-brainer to me to hit a $1 trillion-dollar market cap within the next year," James Altucher, managing director of Formula Capital, said on CNBC's "Fast Money" recently. The record for market cap is just over $650 billion, achieved briefly by Microsoft Corp. (Nasdaq: MSFT) at the peak of the dotcom bubble in early 2000. Only a handful of companies have made it to the $500 billion club, and membership has been fleeting. The list includes Cisco Systems Inc. (Nasdaq: CSCO), Intel Corp. (Nasdaq: INTC) and General Electric Co. (NYSE: GE) – all during the 1999-2000 market peak. The last company to breach the $500 billion mark was Exxon Mobil in 1997. One factor in Apple's favor is that it has risen to its current lofty levels not riding a bubble but despite a recession. And the markets for its existing products, such as the iPhone, the iPad and the Mac, still have room to grow. "The reason Apple has been able to continue growing at a spectacular rate, even as its revenue base has surpassed $100 billion, is because it targets the world's biggest markets," Robert Cihra, an analyst at Evercore Partners, told The New York Times. "The simple fact is that they still have a small share of huge markets – single-digit shares in both PCs and mobile phones." Naturally, getting to $1,000 a share and a $1 trillion market cap will require the addition of new sources of revenue, as well as sustaining growth in existing markets. Near Field Communication (NFC), and it would transform the iPhone into a digital wallet. NFC is a form of wireless payment that can be built into mobile devices. While not new, NFC technology has needed a major push from an influential company like Apple for it to go mainstream. Although NFC did not appear in the iPhone 4s, many expect it in the next iPhone refresh. And many suspect Apple has is in negotiations with MasterCard Inc. (NYSE: MA) and Visa Inc. (NYSE: V) to link credit card accounts to an NFC-enabled iPhone. The lure for Apple is not a cut of the credit card fees, but advertising. Specifically, NFC on an iPhone would enable targeted advertising based on data collected from their actual buying habits. That's the Holy Grail for advertisers. "Whoever is able to do that, they will command significant streams of revenue, because that information is extremely valuable for marketers-"I spent this much and it led to this amount of sales,'" Paul Gelb, vice president of mobile atinternet marketing firm Razorfish told Mobile Commerce Daily. Apple's legions of iPhone users, who tend to be wealthier than even other smartphone users, would be ideal targets. "This new data and integrated [NFC-based] service offering could generate billions if not hundreds of billions of dollars in incremental ad revenue," Gelb said. An Apple-branded television – dubbed by pundits as the iTV – would insert Apple into yet another large new market. True, the market for televisions is mature and profit margins thin, but those have proven ideal conditions for Apple in the past. If Apple can re-invent the television with a revolutionary interface based on its Siri voice technology and integrate it with the rest of the Apple ecosystem, it would completely upend the TV manufacturing industry. And industry-changing products tend to add billions to Apple's bottom line. "If Apple were to sell a TV, we continue to believe its margins and pricing could be industry leading given its vertical integration with content," Barclays Capital (NYSE: BCS) analyst Ben Reitzes wrote in a note to clients. Reitzes calculated an iTV could contribute $5.40 of earnings per share (EPS) to Apple's bottom line in its 2013 fiscal year. Reitzes puts Apple's total estimated EPS for 2013 at $48.46. When you multiply that by Apple's current price to earnings (P/E) ratio of 15, you get a stock price of $727 and a market cap of $677 billion. That's already beyond Microsoft's record and well on the way to the $1,000-plus target required for a $1 trillion market cap. Apple likes to say that education is in its DNA, so its new education-oriented initiative, iBooks 2, comes as no surprise. Launched in January, iBooks 2 is a strategy to adapt textbooks to the iPad, starting with $14.99 high school textbooks and expanding to (presumably more expensive) college books later. Apple has partnered with the top three textbook publishers, The McGraw-Hill Companies Inc. (NYSE: MHP), Pearson PLC (NYSE ADR: PSO) and Houghton Mifflin Harcourt, which together control 90% of the textbook market. The publishers hope to sell more of the less expensive digital versions, which will be easier to update and will be far more interactive. And as with music and video on iTunes, Apple will take 30% of all sales. The textbook publishers don't see this as a problem, as distribution and printing costs typically account for 25% of a paper textbook. While not as huge as the TV or mobile advertising markets, higher-education textbook sales did rise 23% last year to $4.5 billion. A study by social learning platform Xplana predicted digital textbook sales would hit $1.5 billion by 2015, although that was before iBooks 2 was announced. But just as important to Apple is how iBooks 2 can encourage iPad sales and give schools (and students, for that matter) another reason to stay within the Apple ecosystem. That's also why iBooks 2 is easily integrated with iTunes U, Apple's online repository of free course materials. 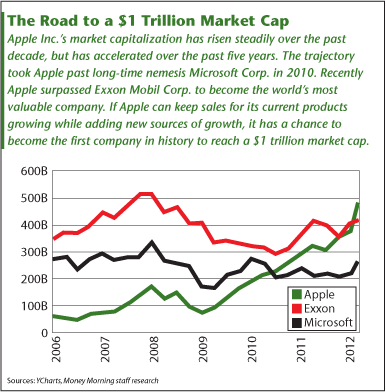 When you add it all up, a $1 trillion market cap for AAPL is not that far-fetched. "There's no mathematical reason Apple can't keep growing at a premium rate for at least several more years," Evercore's Cihra told The New York Times. "At the end of the day, there's no good reason for market cap to be a ceiling." Can Apple become the world's first trillion-dollar company? You get it. So many journalists focus on technical factors meaningless to AAPL – factors such as "large numbers" and ETF/fund restrictions on stocks without dividends. AAPL moves to its own drum. Like you, I read the iBooks announcement as a game-changer in education. But I also see it as a game-changer in business. As a sales tool, the iPad is being purchased by the thousands at a clip, and hidden from the App Store are the thousands of private sales-support apps being created for medical and other company sales forces (my company ProClinica makes them). iBooks hits at a time when paper instruction manuals and brochures are being discarded for electronic alternatives. I've been teaching myself iBooks so I can appreciate – and sell – the power of this new platform. What is almost comical is how so many investors attempt to drive down the stock with clear coordinated sales below any market price, for the shortest of gains. And each time, AAPL demand quickly erases gains. I got in late, at 321, and I've been tempted often to sell and take profits. But then I think – why? I can't find anything else to invest in that compares to AAPL. So I simply buckle my seat belt and hang on. "The lure for Apple is not a cut of the credit card fees, but advertising. Specifically, NFC on an iPhone would enable targeted advertising based on data collected from their actual buying habits"
Apple is great at selling hardware, and making transactions easy (buying music, books, apps, etc). They already have 250M credit cards on file. There's no reason for them to change their focus. For them to pursue advertising integrated with NFC would be like them streaming their video with ads included (hulu style). They don't do that because they are not an advertising company. They are a product company. Fine article, but the first line is wrong, as stated. PetroChina, though priced in yuan, was over a trillion US dollars at the end of its first day of trade (November, 2007). Apple can not then be the first except for "NASDAQ" or "US markets" or "dollars as primary currency." ExxonMobil was a very distant second, at $488 billion. "In the near future our kids and grand kids will all be toting a slim iPad instead of a Sherpa-sized backpack full of books to school right up to their professional degrees. Updated nightly with interactivity. A no brainier." A no brainer is right. The iDiots won't even bother with learning how to read and understand – their iToy will be doing that for them. Brain no longer required. A mindless make-believe society. Will that trillion dollars be measured in the counterfeit currency being generated daily or in blood-soaked petrodollars? It is easy to predict what Apple's market cap and share price should be. Apple's market cap has a strongly linear relationship to its cash hoard. Apple's market cap = 4-times Apple's cash hoard. and is subject to psychological whims and stock pundit manipulation. Thus, with $100 Billion in cash, Apple's market cap should be $400 Billion. It's current $550 Billion valuation is purely hype for that extra $150 Billion. For Apple to be worth $1 Trillion, Apple's cash hoard needs to be $250 Billion. I know everyone is looking forward to a dividend, but I'd rather see their extra $100B used to hire every top engineer and programmer who isn't alread working for them… plus a few physicists. In 5 years they'll be improving our satellites and our military will be sporting Apple weapons. In 10 years, Apple will be trying to decide on a name for its teleporation device since "ipad" is already taken. In short… R&D, Apple military contracts, and transportation. Don't worry… it's ok to hold your breath, this time. I think there is another innovation that will drive Apple Stock higher. This is the retina display on the iPad 3 which will encourage high resolution applications required in the medical, aeronautical and engineering fields to name a few. Examples include the ability to view X-rays and other images in hospitals, maps for pilots and manuals for engineers. Retina screens will also appear on the next range of Macbooks. all the others just keep on pumping. Another big wedge, waiting to be driven hard, needs to be mentioned . Macs in the corporate workplace. The Belgium Ministry of Finance has been totally down for more than 3 weeks with a virus that even the McAfee experts cannot fix. I bet they wish they were running Macs !!! Mac marketshare is going to snowball also with all the baby boomers getting their golden handshake for retirement. iMac, MacBook Pro, MacBook Air, Mac Pro or Mac Mini, take your pick. I reckon also the car market is a big one – Apple has not made any penetration – but Apple technology (design simplicity) would be a perfect addition to modern motor vehicles.